Does anybody have any exciting New Year’s resolutions? I’ve never been a believer in resolutions (I’m more in the “no time like the present” camp; that is, why do we need a new year to set goals? ), but this year, I thought it would be fun to have some. Off the top of my head, I finally want to learn how to make macarons (mine always come out sad and cracked) and climb my first 5.12. I don’t know how attainable either of those resolutions are, but personally, I’m just glad that 2014 is over. It’s been a little bit of a rough year, having to deal with first-time home ownership woes and weird hiccups in my day job. I’m ready to start fresh and new. I’ve already started with small changes here and there; things like walking to work instead of riding my bike, and quitting my Crossfit membership in favor of other exercise. After doing both for years and years, it feels good to finally switch things up. I’ve had my eye on this recipe for years now, ever since I first spotted it in the pages and on the front cover of Valerie Gordon’s wonderful cookbook, Sweet. A decadent cake for the new year, this cake is made of four levels of champagne-soaked golden butter cake, layered between chocolate ganache frosting and a milk chocolate glaze. 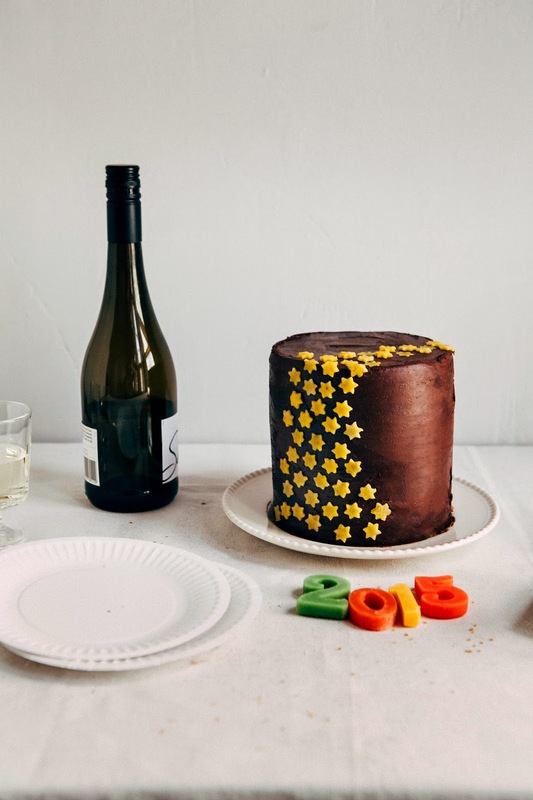 In honor of the occasion, I pulled a Molly Yeh and decked the cake out with marzipan decorations; in this case, a constellation of yellow marzipan stars shooting across the chocolate glaze. Although I usually prefer baking with dark or bittersweet chocolate, in this case, it’s especially important to use milk chocolate for both the ganache frosting and the glaze. Dark chocolate will drown out the subtle, delicate flavors of champagne. The cake requires both a ganache and a glaze because on its own, the ganache will be dull, lackluster and not very pretty to look at since it contains gelatin. I know, I know, it’s weird that the ganache contains gelatin, but it’s there to give the frosting the structure it needs. If you’re looking for less work, feel free to omit the glaze, but don’t say that I didn’t warn you about its appearance. If you prefer to make a wider (as opposed to taller) cake, you can bake the cake in three 9-inch pans as opposed to the four 6-inch pans that I used for my cake. Just be sure to adjust the baking time and bake it for 25 to 35 minutes as opposed to the baking time I listed in the instructions below. Center a rack in the oven and preheat to 350 (F). Spray four 6-inch round cake pans with cooking spray, and line the bottom of each cake pan with a parchment paper circle. Spray the parchment circles. Set aside. In a medium bowl, whisk together 3 1/4 cups all-purpose flour, 3/4 teaspoon baking powder and 3/4 teaspoon kosher salt until fully combined. Set aside. In the bowl of a freestanding electric mixer fitted with a paddle attachment, combine 1 cup plus 6 tablespoons unsalted butter, 2 cups granulated sugar and 2 tablespoons light corn syrup. Beat on medium-high speed until light and fluffy, about 5 minutes. While the butter and sugar is beating, whisk together 6 large eggs, 1/3 cup sour cream and 1 1/2 tablespoons pure vanilla extract in a liquid measuring cup. After the butter and sugar has finished beating for at least 5 minutes, lower the mixer to its lowest setting and add the egg/sour cream/vanilla mixture and beat until smooth. Use a rubber spatula to scrape the bottom and sides of the bowl and mix for another additional 30 seconds, before turning the mixer back to its lowest speed and adding the dry ingredients (from the 2nd step) in two batches, mixing for 30 seconds after each addition. Scrape the bowl again and mix for another 15 seconds. Divide the batter evenly among the prepared cake pans, using an offset spatula to spread and level the batter around each pan. Bake in the preheated oven for 35 to 40 minutes, or until the cakes appear firm and a skewer inserted in the center of each cake comes out clean. Transfer the cakes to wire racks and allow to cool completely in their pans. Once the cakes are cooled completely, use a serrated knife to level each cake. 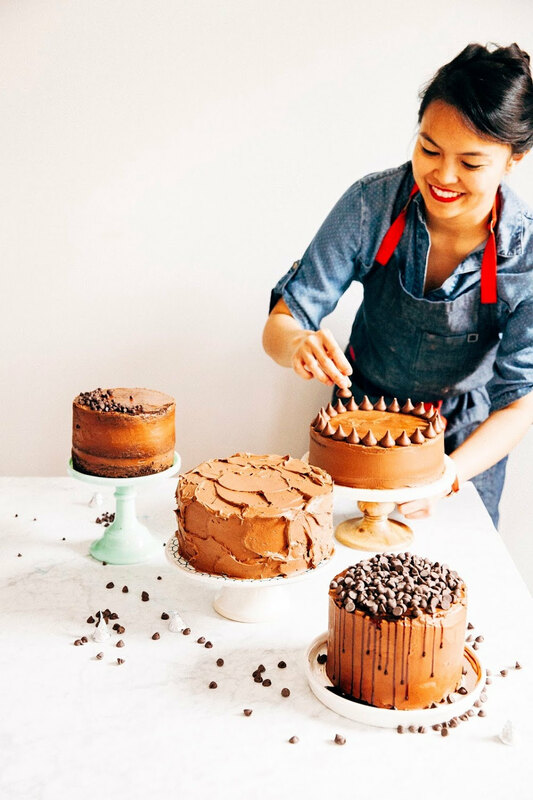 Use a skewer or a fork to poke the top of each cake with holes repeatedly. Drizzle 1 tablespoon of champagne over the top of each cake, using an offset spatula to spread any excess champagne over the cake and into its crevices. Wrap the cakes in plastic wrap and refrigerate until you are ready to assemble the cake. Pour 3 tablespoons cold water into a small bowl, and sprinkle 1 tablespoon powdered gelatin over the surface of the water. Let sit for 10 minutes to allow the gelatin to "bloom" and soften. While the gelatin is blooming, combine 2 cups finely chopped milk chocolate and 2 ounces finely chopped bittersweet chocolate in a double boiler (or a heatproof bowl set over a pot of steaming water). Melt over medium heat, using a rubber spatula to stir the chocolate occasionally to help melt it faster. Once the chocolate has melted, whisk together 1/4 cup heavy cream, 3 tablespoons light corn syrup and bloomed gelatin (from the 1st step) in a liquid measuring cup and pour over the melted chocolate. Use a rubber spatula to stir the mixture in one direction, concentrating on the center, until the ganache is smooth and glistening. Once the ganache is smooth and glistening, whisk together 2/3 cup champagne, 2 tablespoons cognac, and 1/2 teaspoon pure vanilla extract in a liquid measuring cup. Slowly pour the champagne mixture into the ganache, continuing to whisk the ganache constantly as you do so — be careful not to add the champagne mixture too quickly, or the ganache will separate! It's best to add just a couple tablespoons at a time. Once the champagne is completely incorporated into the ganache, add 9 tablespoons unsalted butter, a couple cubes at a time, and continue whisking until the butter is completely melted, about 1 minute. Once the butter is completely incorporate into the mixture, transfer the ganache to the coolest part of your kitchen and let set, stirring occasionally until warm but still spreadable, around 20 to 30 minutes. If you wait too long, the ganache will be too hard to spread! You want it to be warm but not hot, and it's better to use it while it's on the warmer side as opposed to the cooler side. Use an offset spatula to spread it between the cakes, layering each one on top of the other (I used about 1/4 cup of ganache between each layer). Cover the sides of the cake with the remaining ganache frosting and allow to cool completely before glazing and decorating with marzipan stars. Place 9.5 ounces finely chopped milk chocolate in a medium, heatproof bowl. Set aside. In a small saucepot over medium heat, whisk together 3/4 cup heavy cream and 2 teaspoons corn syrup. Heat until it just boils, before pouring it over the chocolate. Let sit for 1 minute. After 1 minute, use a rubber spatula and begin stirring the mixture in one direction, concentration on the center, until the mixture is smooth and glistening. Add 4 tablespoons butter, one cube at a time, and continue stirring until the butter is completely melted and fully integrated into the mixture, about 1 minute. Transfer the glaze to a liquid measuring cup and cool to between 90-95 (F), before pouring evenly over the ganache-covered cake. Immediately use an offset spatula to spread the glaze around the cake to create a smooth look. Once the glaze has set on the cake (about 1 to 2 hours), make the marzipan constellation topping. Use your hands to knead 2 drops yellow food coloring into 2 ounces marzipan. On a clean work surface lightly dusted with confectioners' sugar, roll out the marzipan. Use a mini cookie cutter to cut out little shapes, and press the cutouts gently on to the cake. 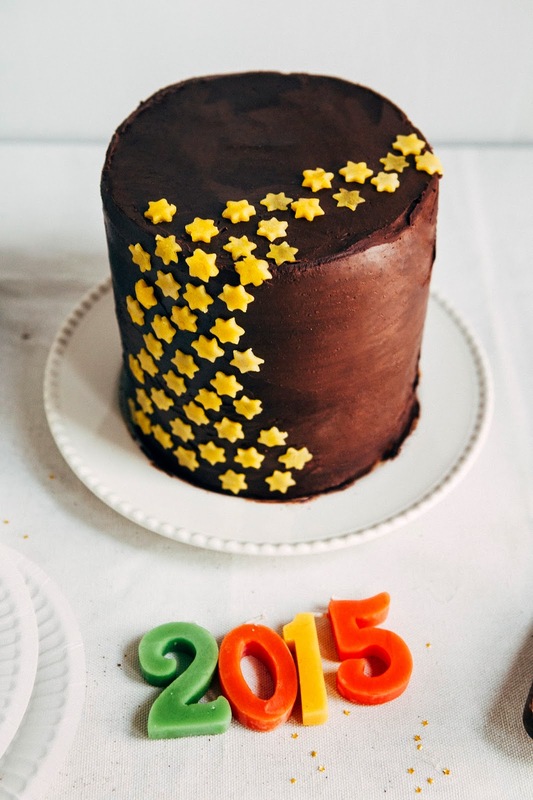 Such a gorgeous little cake with those stars. Happy 2015 to you! MIchelle do not give up on macarons! I had almost twice as many failures before I could get them just right this year for my macaron Christmas tree for my blog. If you ever want any help on macarons, drop me a line. The cake is simple in design but I love it that way. The cake should be the main event :). Happy new year! Thanks Ileana! Happy New Year to you as well! Omg, I might just take you up on that. I would love some advice on macaron making! 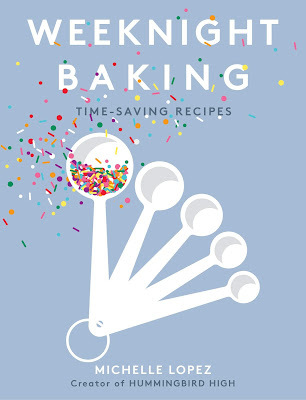 Especially since your baked goods are always, always so stunning. Thanks so much Belinda, and Happy New Year!!! No, so glad I found YOU this year. Your blog is just so, so stunning and keeps getting better every time I visit. Happy New Year! Thanks June! 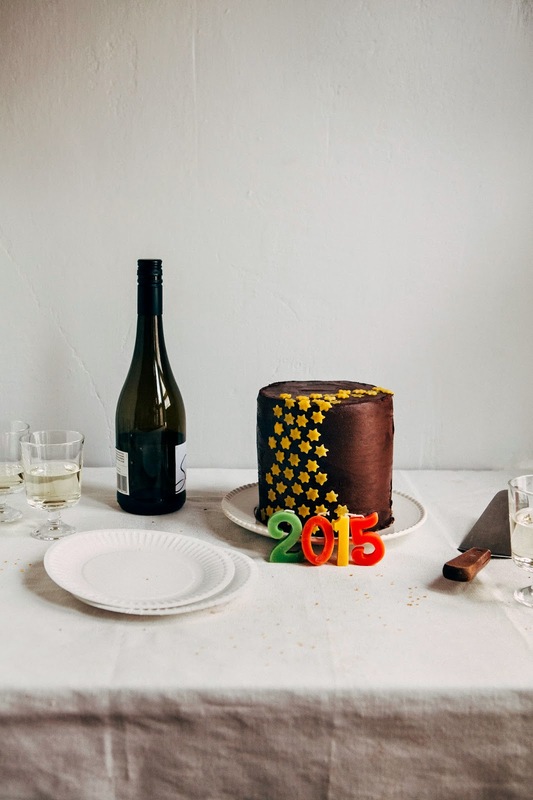 I mean, chocolate + champagne = the perfect start to the New Year, always. 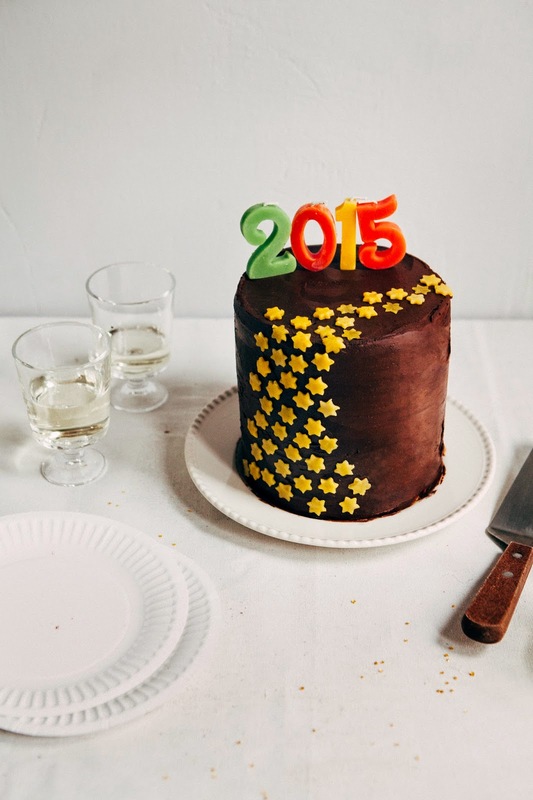 Happy Happy Birthday 2015! This cake is so elegant. Celebrating tonight with a massive slice would bring a smile to my face. Beautiful indeed!!! Happy New Year!)) Let your 2015 begin with perfect macarons)! Happy New Year, Michelle! This cake is freaking incredible - I'm absolutely in love with that marzipan star-waterfall. All good vibes and wishes for 2015 to you! happy 2015 to you lady!! Thanks Emily! I would gladly give you a slice if I could. Happy New Year! Yes!!! Let's learn how to make macarons together. Happy new year Steph, I'm so glad we got to know each other this past year!!! Thanks Caitlin! I really appreciate that! Happy New Year! Hey girl. Did you ever find your madeleine recipe? I was recently researching why the madeleines sold in stores always stayed so moist n soft versus the recipes I've ever made. I asked a few chefs and I've just concluded that chefs use trimoline (invert sugar) to cut down on the sugar so it's not sticky but retains moisture. Also the long resting time helps the starches hydrate and the gluten relax (perhaps) and the batter homogenize. Bakers do this with bread sometimes, adding water and flour together and letting it sit before finally adding the salt. Gorgeous cake. It's the perfect way to close out the year. 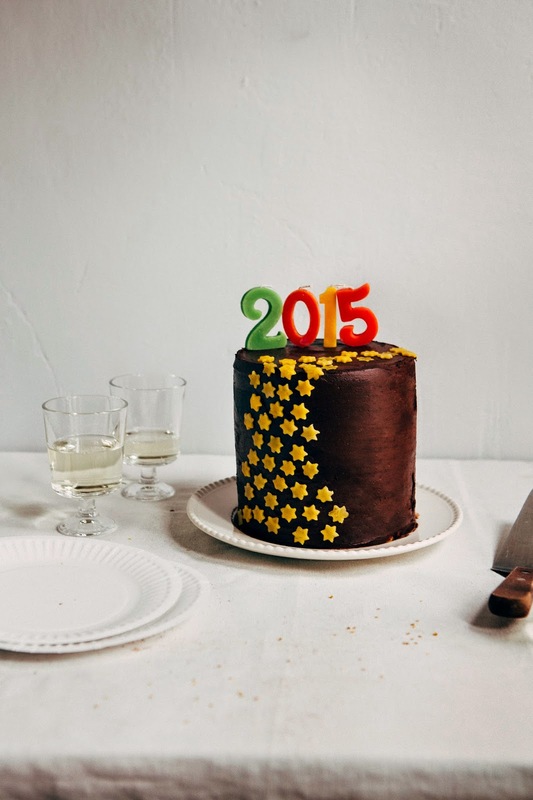 Happy 2015 to you and looking forward to lots of delicious and inspiring things coming from your kitchen. Thanks for be so awesome, Michelle! This cake is gorgeous! I really want to try making it. As for macarons, I'm terrified to try making them! Typically, I don't set full on resolutions, just general goals for throughout the year. I suppose it's sort of the same thing, I just don't consider them to be. I can't wait to see you succeed with macarons! Happy happy new year Michelle! 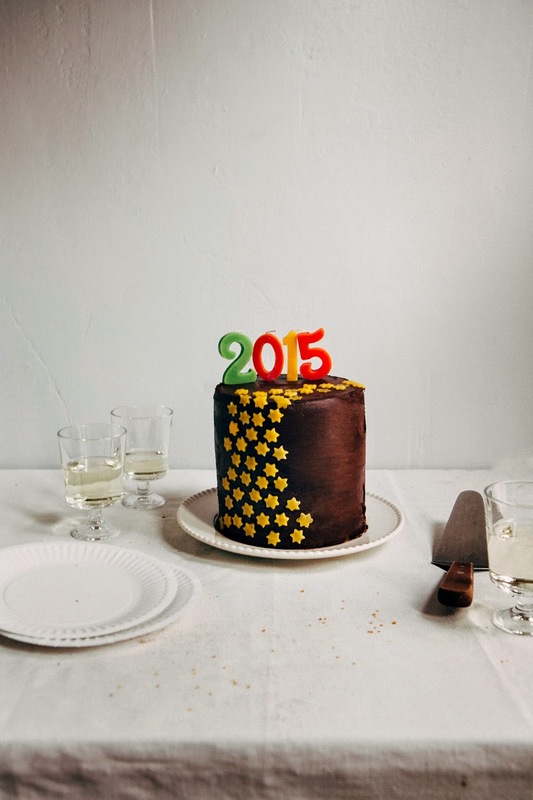 I can't wait to see what 2015 has in store for you and all of the treats that you'll be dishing up for us here. Champagne + chocolate to start? I'm so in. Hello, just curious about making these ahead of time. Could I make the batch, leave it in the fridge overnight, slice them and stick them in a ziploc bag in the freezer? I would wait to add the spice dusting until they've unthawed. Thanks! This looks amazing! I am so intrigued by the ganache + glaze combo! Happy New Year! 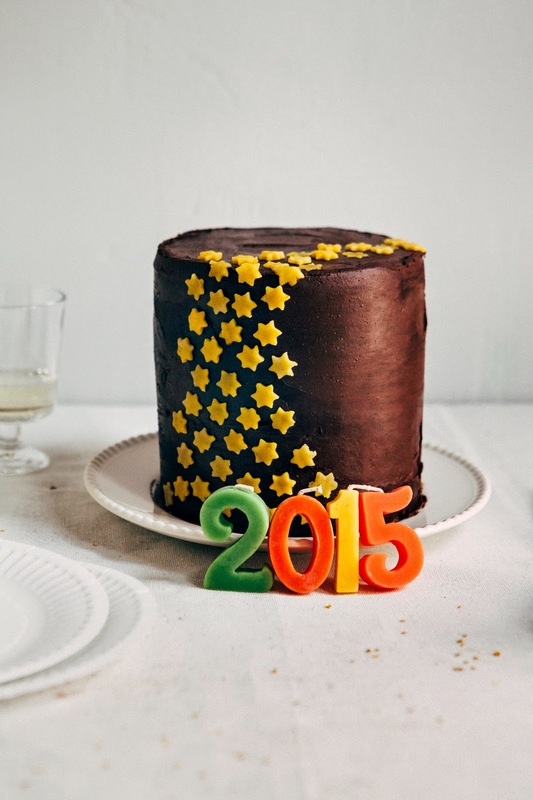 I am looking forward to more of your cakes in 2015!